Stotts Chiropractic is a chiropractic office in San Angelo, Texas, owned and operated by chiropractor Dr. Darci Stotts. Many people wonder how or if a chiropractor, or Doctor of Chiropractic, can help them. In reality, most people can benefit noticeably from chiropractic care. Chiropractic care can help in ways many people wouldn’t even imagine and is a proven and effective method for many aches, pains, and common conditions. Headaches, soreness (including from exercise), and discomfort from bad posture are just a few. Since the spinal column is the central hub of the central nervous system, the nerves extending outward from it affect almost every part of your body, as well as the organs and systems within it. Mental, physical, and emotional stress all have a considerable impact on your spinal column. All these stresses can cause discomfort, pain, and subluxations (spinal misalignments) in your spine. This can lead to a number of problems, most commonly pinched nerves and compressed discs. By focusing on the spine and the nerves that affect your entire body, chiropractic care can help you achieve the relief, health, and overall wellness you want and deserve. Chiropractic care has always had somewhat of a bad persona, but with the right chiropractor it can really change your life. Chiropractic care can offer pregnancy care and pain relief throughout your pregnancy to keep you as comfortable as possible. Stotts Chiropractic in San Angelo, Texas, also offers weight management and nutritional counseling. Chiropractic care really can help you. Do you know it is possible for a chiropractor to adjust your spine without ever touching you with her hands? Not only is it possible, but it is extremely accurate and precise! Assisted by the Pro Adjuster, a machine that uses NASA Technology, and Atlas Orthogonal, Dr. Stotts is able to provide chiropractic care “hands-free” without the popping and cracking other chiropractic methods are known for. Spinal adjustments and therapies, such as electrical stimulation, spinal decompression, cervical traction, and infrared therapy, will get you back on the track to health and wellness. Dr. Stotts’ method using computer-assisted instruments is non-invasive, painless, accurate, precise, and very effective. 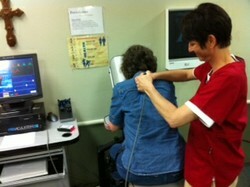 You can either sit or lie still and simply relax while Dr. Stotts performs an adjustment. Stotts Chiropractic is a chiropractic clinic in San Angelo, Texas, owned and operated by chiropractor Dr. Darci Stotts. They offer chiropractic adjustments using computer-assisted instruments, instead of the traditional "snap, crack, and pop". They also offer supplemental therapies, nutritional counseling, weight management programs, exercise plans, and much more. Do you wish you had more energy? Tire quickly? Want to get in better shape or become healthier? Want to eat better and more nutritious? Know someone that does? If so, Stotts Chiropractic can help! Proper nutrition is imperative in reaching optimal health. Your body needs a certain amount of vitamins, minerals, and various nutrients each day, and these needs vary for each person. Stotts Chiropractic offers Nutritional Counseling to help you optimize your diet to ensure proper nutrition. Depending on what your goals, body type, exercise habits, food preferences, we will determine a precise plan specifically for you to reach your goals and a healthy diet. With proper nutrition, you will have increased energy, stamina, feel less “sluggish”, and be more enabled for physical and mental activities throughout the day. Weight management is a big concern and the cause of a lot of stress for a large number of people. Whether you are over weight and can’t lose the pounds, under weight and unable to gain, or just can’t quite get where you want to be, it can be very frustrating, especially on your own. Stotts Chiropractic offers Weight Management Programs personalized just for you and your unique situation. We will start with a consultation, a few analysis, and then customize a weight management plan just for you. This will get you on the right track for your desired weight and body-type, and we will also help hold you accountable by periodic re-exams and frequently checking on your status and how you are doing with the program. Weight management programs entail correcting and optimizing your diet, ensuring proper nutrition, planned caloric, carbohydrate, and protein intake for your desired goals, and an exercise plan. If you are serious about obtaining your desired weight goals and body type, call us now and we will work together to get you there as quickly and healthily as possible. Call today at 325-949-8688 and set up your FREE consultation! What Does it Take to be a Certified First Responder? How to become a Certified First Responder and what you can expect your job responsibilities to be. Looking at getting new medical equipment? Inside this article you'll discover the 9 reasons disposable medical equipment in the future. Number one is important.